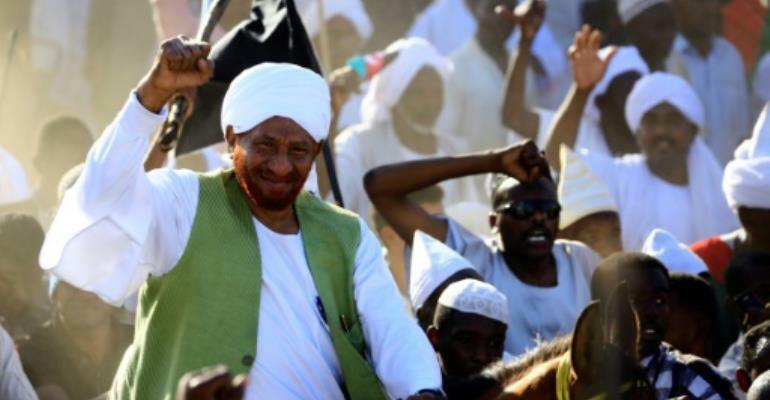 Sadiq al-Mahdi, former prime minister and chief of Sudan's main opposition National Umma Party, called on Bashir to dissolve all constitutional institutions and set up a 25-member council to govern Sudan. "I call on all our people to participate in widespread rallies tomorrow, on April 6, to meet the call of their homeland," Mahdi told worshippers during the weekly Muslim prayers, according to a statement issued by his party. "I call on President Bashir to resign, dissolve all consitutional institutions and form a council of 25 people to govern the country," he said. Mahdi also told scores of worshippers at a mosque in Omdurman, the twin city of capital Khartoum, that Bashir should end a state of emergency he imposed in February in a bid to end protests that have rocked the country since December. Bashir swept to power in an Islamist-backed coup in 1989 that toppled Mahdi's civilian government. Late on Friday Bashir held a meeting with political allies and members of civil society groups where he said the issues concerning the country's youth need to be addressed. "We need to have a dialogue with our youth, we have to go to them," said Bashir at the meeting held at the presidential palace in Khartoum. "We need to have a dialogue about how the country can be ruled now and in the future." The country's youths, majority of them women, have been at the forefront of the protests against his rule. Angry demonstrators have accused Bashir's government of mismanaging the country's economy. It spilt onto the streets on December 19 following a government decision to triple the price of bread, quickly sparking nationwide rallies against Bashir's rule. Protest organisers chose April 6 for nationwide rallies as it was the day of a 1985 uprising that toppled the regime of president Jaafar Nimeiri.